Purchasing the best wireless surround sound system for your home will enhance your listening experience. When you are preparing to enjoy a movie night and need theater-like sounds to enhance your experience, having a wireless entertainment system will offer that audio stimulation with clean and crisp sounds. From music producers to everyday consumers, having a clear-sounding speaker blasting your favorite music or videos will allow you to hear sounds that you have never heard before! 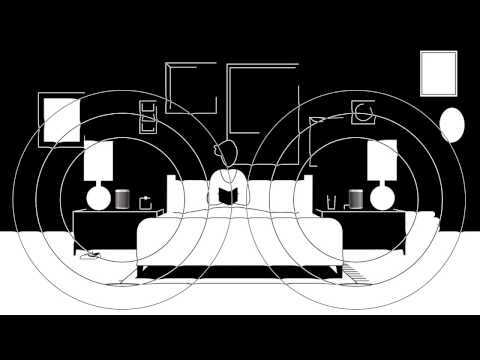 Wireless surround sound systems are great for anyone who wants to sit back and relax after a hard day at work or school. These systems provide the perfect opportunity to mentally disappear in an ocean of elegant sounds for the ultimate hearing pleasures. 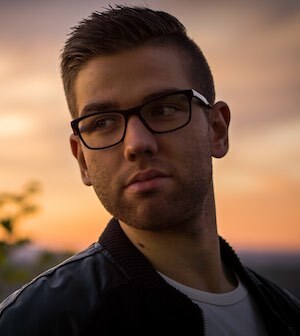 Choosing the right product that suits your needs is very important to evaluate high-quality streams and deep bass hums. 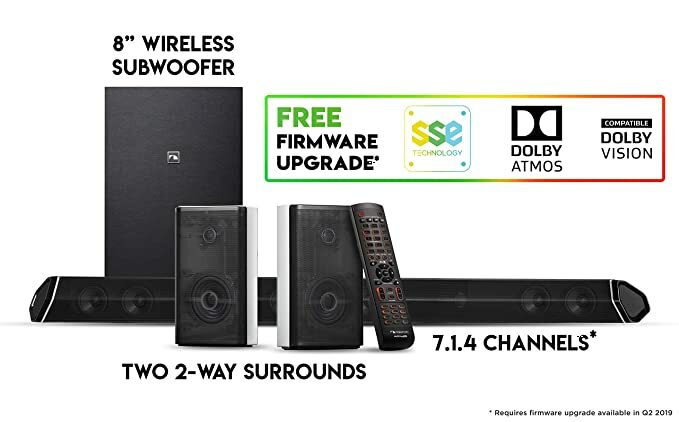 What is the best wireless surround sound system to buy in 2019? It is time to bask in the musical energy of an entire home theater system delivering the whole package on a silver platter. Upon first impressions, this unit is extremely stylish and capable of matching any interior. 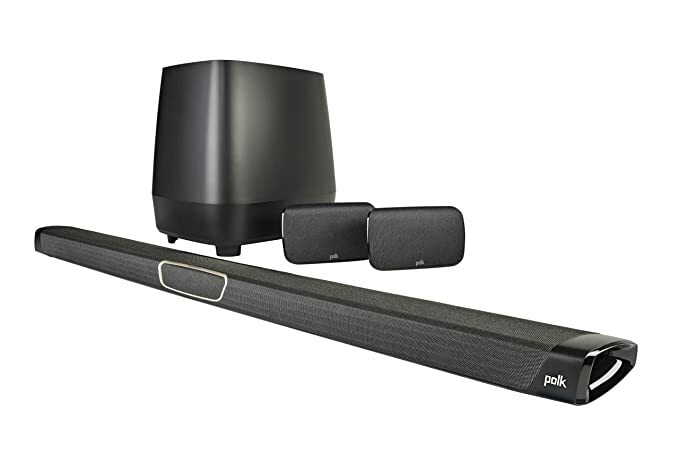 This system combines the PLAYBAR, PLAY:1s, and SUB technologies together for the right amount of synchronization that produces balanced soundwaves. It also comes with 9-amplified speakers that were constructed for durability and power. The 2-force cancellation has the right amount of buzz and vibration for soothing sounds as the music flows. Surround sound fills the entire room with a deep and low soundwave bass that accentuate the specific things you never heard in the track, until now. No matter if you are playing a video game, watching a movie, or listening to music, these speakers will step up to the plate and hit the ball right out of the park! They give off the vibe that you are in the middle of the action with auditory experiences hitting you from every direction. You can also connect to Amazon Dot or Echo and communicate with Alexa through the speakers. It is compatible with over 30 streaming services including Spotify, Pandora, iHeartRadio, and Amazon Music. After arriving at your home, there are wall mountable clamps in the back. You can easily install this unit on an elevated surface. The downloadable Sonos app is available for setup assistance. It has Speech Enhancement technologies and a night mode that turns the sounds low and melodic. Yes, this product is recommended for buyers who want the full package of a home entertainment system that will last a long time. This is a great investment! They could hook up these speakers to multiple devices including a television, radio, and even a video game. This is one of the best wireless home systems on the market, but the only drawback is the expensive pricing. Those in the professional audio-related fields might be willing to pay a premium price for this investment. Moreover, “audio freaks” would love this product as well. However, regular people might need to settle for something a bit more simple and affordable. This is the number one-rated theater sound system with the latest tech meeting all your digital needs. 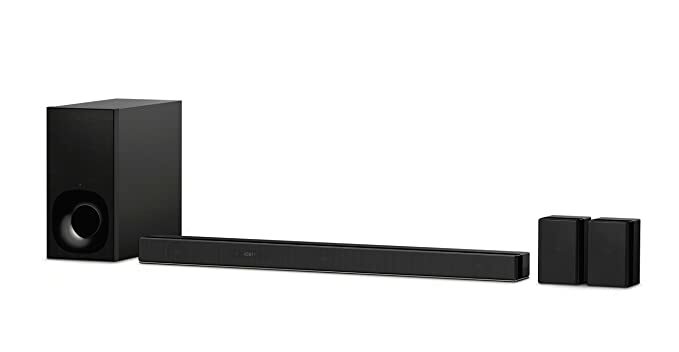 This system comes with a 400-watt, 45-inches soundbar standing tall with confidence. It also has an 8in subwoofer and satellites speakers delivering superior quality sounds. There is an HDMI port in the back for connecting various devices and 4K video resolution that is compatible with the latest tech of today. 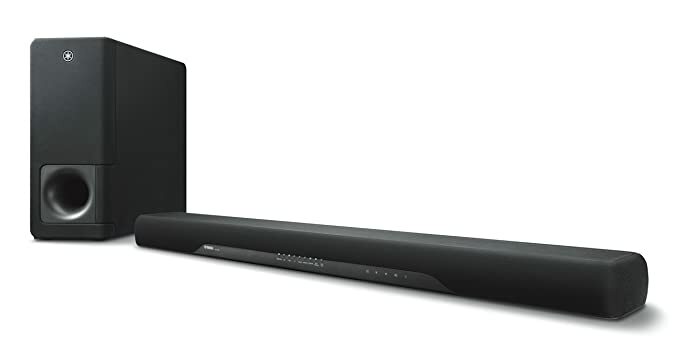 Rated as Amazon’s number one soundbar, because of its authentic, lifelike audio, this speaker has the whole package. 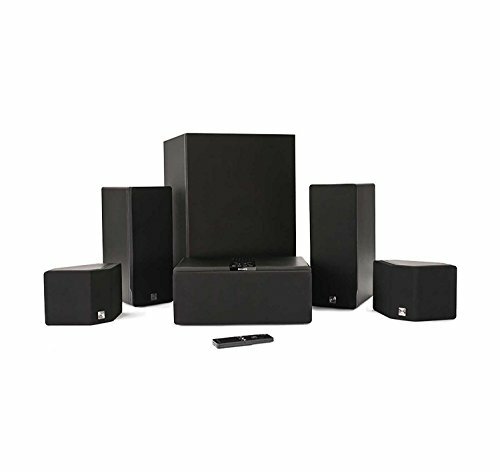 This unit comes with DTS digital surround sound effects and DSP 15 surround sound mode chipsets to choose from. Enjoy the deep bass generating low hums at 25Hz with a crystal clear sound reaching 104db. There a UDB, Bluetooth connectivity, and an Optical Input with the latest version of firmware. If you purchase the product on Amazon, there is an expert installation service available for a reasonable price. The representative will come to your home and mount the unit on the wall. Then, they will test the system to make sure it is working properly. Next is the testing of the sound quality to make sure it reaches your expectations. Lastly, there will be a demonstration of how the product works. Some customers report bad ARC ports that will eventually create a faulty video with annoying specks on the screen. The unit might also have an issue with Bluetooth pairing and synching. Faulty units might have a bad sound and/or stop working after a month or so of use. Sometimes they might even shut down on their own. Some customers report streaming problems with crackling sounds. Others report a possible defective firmware patch that creates even more problems. In short, yes. One of the best selling points of this speaker is the theater-like sound that it produces. That is absolutely perfect for people who pay very close attention to every small detail. 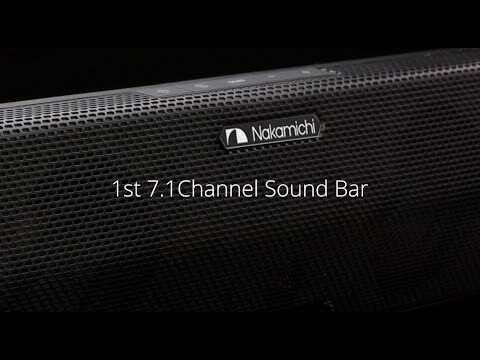 Although there are some technical issues that should not get overlooked, this average soundbar is still worth your consideration. This deluxe soundbar is made by a superior brand that makes high-quality products that last a very long time. This specific product has a subtle design that matches well with a low-key interior. It is also wall mountable. 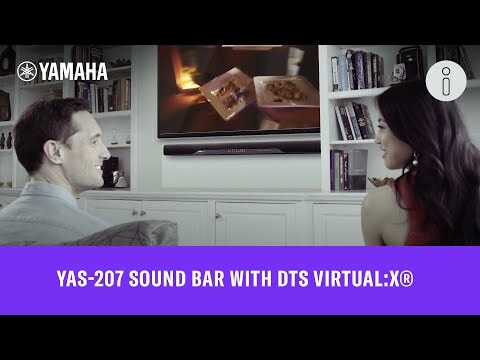 There are a 3.1ch Dolby Atmos and DTS:X TV Soundboard Speakers for the best production of a large bass boost. Moreover, there is a Bluetooth technology available for wireless connectivity. You have the choice of getting this unit with the Dolby Atmos speaker along with the rear wireless speaker to complete the package. Additionally, if ordered your unit on Amazon, there is an expert service for a full in-home installation. Buyers can enjoy the elegant sound from the vertical surround sound speakers that creates an immersive listening experience. This system is 4K compatible for multiple wireless streaming devices. 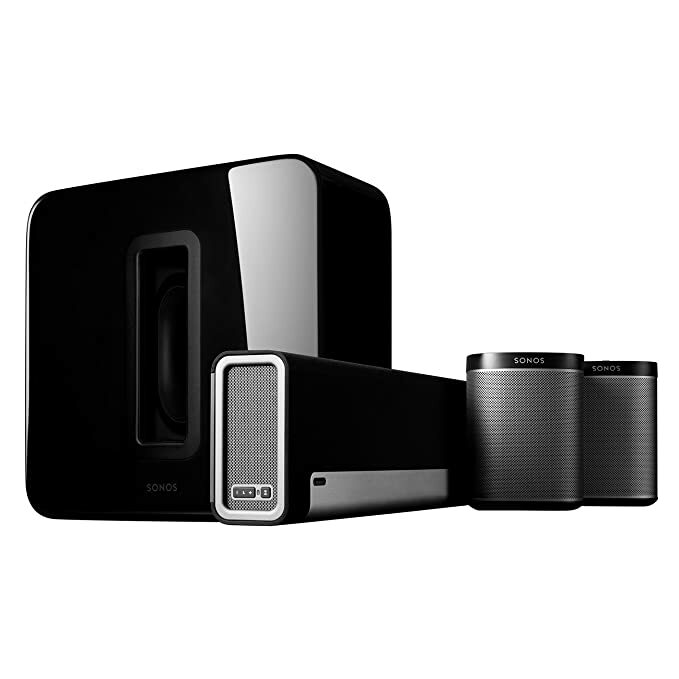 There are external subwoofers that booms with a deep sound, an HDMI cable port, and a remote for controlling the channels. Sony is a high-end brand that produces high-end products. We are sure this system will be extremely reliable for you. When searching for reviews about this product online, there are not many negative ones; which is a huge plus. Most of the negative reviews that you do find are geared towards personal dissatisfactions. This is a very stylish speaker with interesting subtle designs for an incognito look. The unit is about 42in long, so it will need a large space to fit in. It also produces 102db of sound power. There is Bluetooth feature available for wireless connectivity. Moreover, there is a wall mount. A simple remote comes with the unit. The RCA cables will connect to most large appliances and devices. There is also an optical digital cable for producing a premium-quality video. A Quick Start guide is available for setting up the system. The speakers are no longer adjustable. They stay locked in the same place. The remote is flimsy and may break easily. Once the item breaks it is out of warranty. Then, it will be very hard to find an independent electronic repairman to fix it. You need to also re-pair each device every time you switch from one to another. 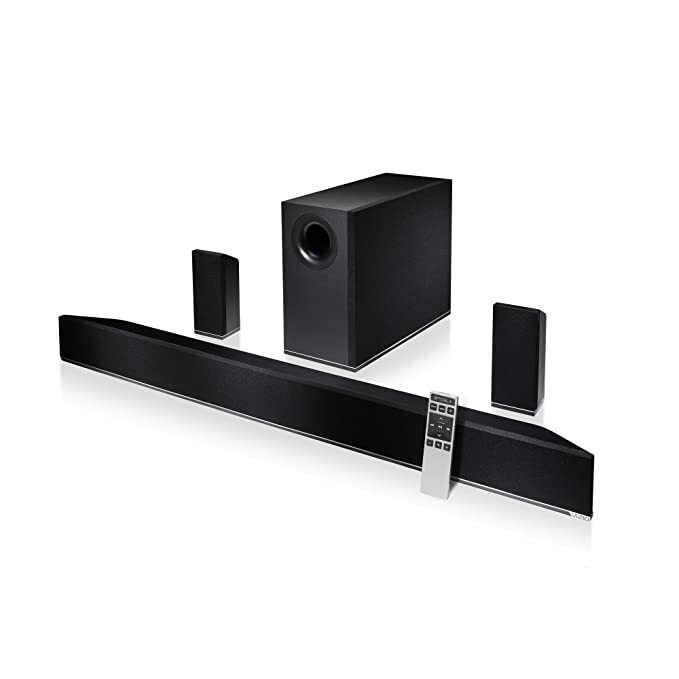 This unit is made by a high-end brand and has specs and features expected from a good soundbar. There are a few cons, but they do not outweigh the pros. The speaker is reasonably priced. That is one reason why many people love it! There are several speakers that come with this entertainment system. You do not need a video receiver or speaker cables to play the audio because these systems are already built in. 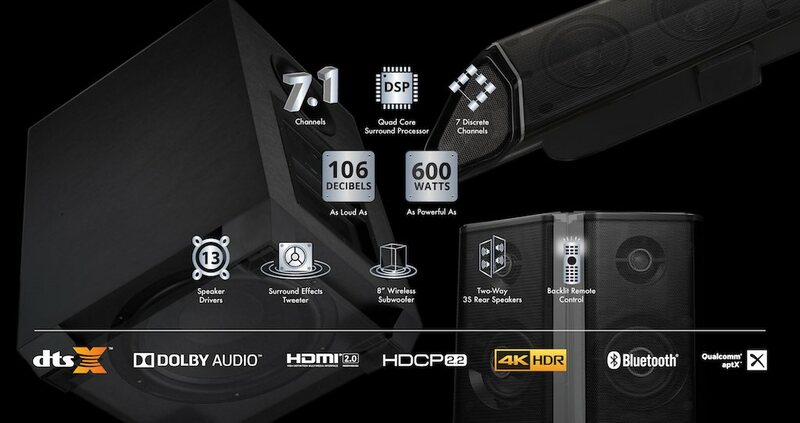 The HD studio has full-range drivers and Dolby Digital and STD for cinema-like, uncompressed, 24-bit HD sounds. There is no need to worry about lagging because the internal transitions stay fluid and consistent. This unit has about 3 HDMI inputs for connecting various devices at the same time, including DVD players, DISH, and streaming media players. There is a 3mm Analog, optical, and Bluetooth input available. You can use this unit with different apps such as Android and iOS. Some customers report various system glitches that could limit your enjoyment. There is no display on the unit, so you need to look at the television screen when you are switching from other devices. 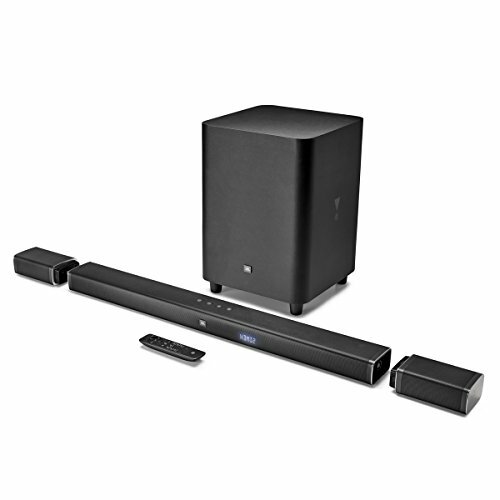 This unit offers everything expected from a soundbar. It also works with well multiple HDMI ports, which means you can connect and play many devices all at once. The unit is a bit pricey, but average priced compared to others. The were many improvements to this unit compared to the past releases. Helpful customer service; representatives will do everything to ensure that your product is working properly. This system only comes in two pieces; therefore, there are not many parts for you to be responsible for. One likable aspect of this system is that it is affordable; one of the cheapest on the list. There is an expert setup service available on Amazon for installing the unit. The representative will test out the system to make sure it is working properly. It has Bluetooth connectivity for wireless connections. There are also HDMI (cables sold separately), optical, and analog ports as well. A simple downloadable setup is available for Android and iOS users. There is no playback for WIFI on Chromecast, Spotify Connect, etc. This unit sometimes will change the sound volume in sporadic ways. Some customers report that the volume is too low for their tastes. This system is recommended if you need an affordable surround sound for a cheap price. It has an average sound quality but also has a unique DTS Virtual 3D surround sound system. The design is compact and slim for fitting in tight places. No matter what the cons say, it seems that the pros generally dominate. However, keep in mind that you will take a chance of receiving a defective unit that might not last long. However, this product might be perfect for people who are new to the surround sound experience. It is basic, but also superior in its own way. There is an expert setup service if you decide to purchase this product on Amazon. The rep will come to your home and mount the unit on the wall. They will test out the sound quality and demonstrate how it works. This product has a detachable battery-powered wireless speakers with over 10 hours of playtime. It is also Dolby Digital and Dolby Pro Logic and DTS compatible. The rich bass will pump through the 10 inches, 259 mm wide wireless subwoofer. 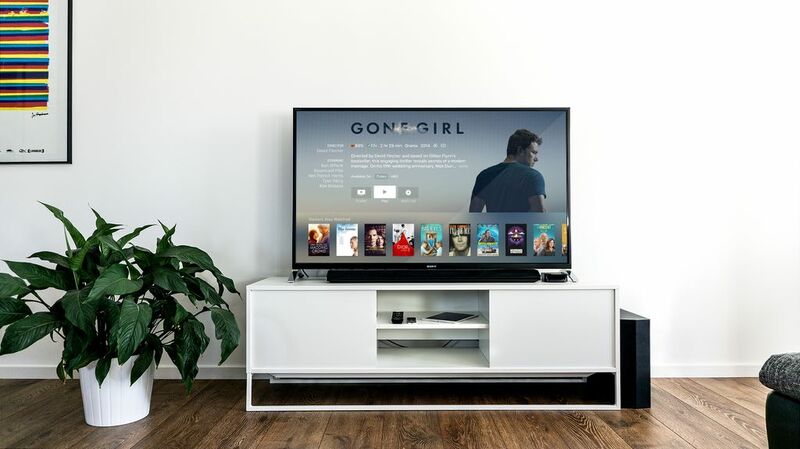 There is an easily established connection to 4K devices for Ultra HD home entertainment. This product is definitely recommended. Although it is somewhat basic, it is best anyone who needs an “eargasm”. If you are a person who likes to produce music, do voice overs, or edit movies or music videos, then a wireless surround sound system will be the best choice for you. You will be able to hear things in the track that was not heard before. This will put you at a vantage point to fully grasp all the sounds. Low-quality speakers might produce mumbles, but high-quality speakers usually deliver the intended results. Does It Have The Latest Technology Features? One modern technological feature to look for is if the speaker connects to your Amazon products. This includes Alexa and Echo. Music will play through the Echo, and Alexa will respond to your requests through the speaker. 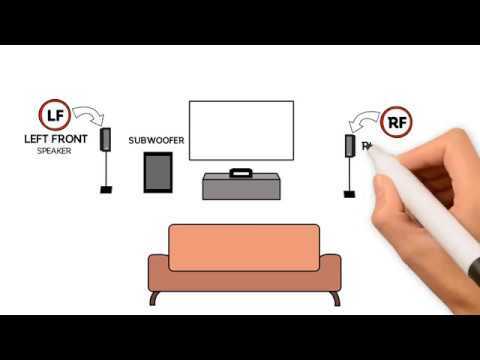 Make sure that the wireless surround system is able to connect to your preferred apps. Some people prefer to use iHeartRadio over iTunes. Others prefer playing Xbox over Playstation. Check the compatibility of these entertainment systems with your preferred speakers. 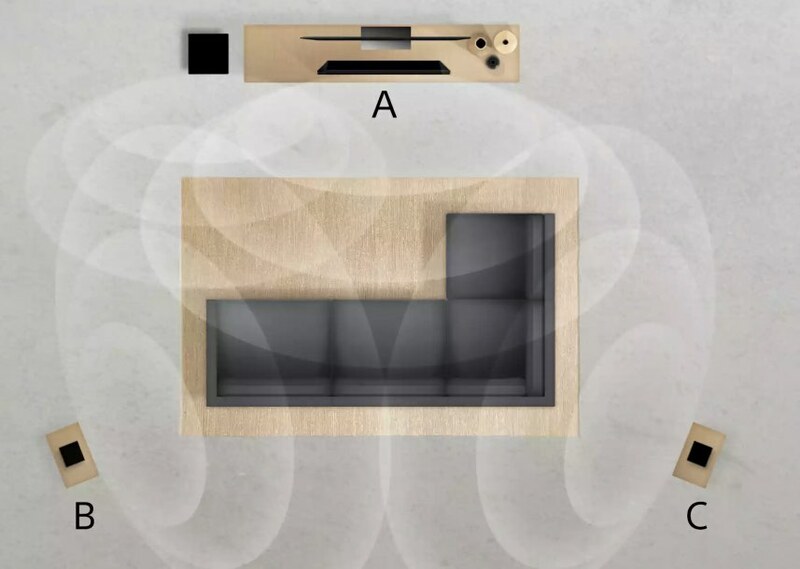 Where Do You Want To Put The Surround Sound Home Entertainment System? Do you think the bedroom is better? How about the living room? Each unit looks better in certain rooms. If you purchased an expert installation service, then you could ask the representative for placement advice. 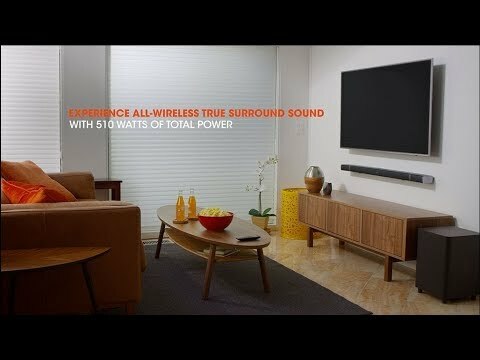 Although the majority of speakers have wireless setups, make sure they can connect to Wi-Fi, have a remote, has Surround Sound, and Bluetooth capabilities. Some systems are low-end and others are high-end with various price ranges. They all offer different specs and features that you will find extremely useful. Of course, the high-end choices are the best because buying the low-end choices will put you at risk of getting a defective product, creating more problems for yourself. There are many great products on the market today for you to choose from. You have learned about the best wireless surround sound speakers. Some will work for you, but others will not. Understand that the surround sound systems are a stepping stone for future releases. Many tech giants expect that future products will look sleeker and have better connectivity. Moreover, some of them will become smarter and have better on-demand features.